Roger-Edgar Gillet's pictorial itinerary revolves around widely differing periods that often resulted in his voluntary isolation from the Paris art scene. Although, at the start of his career, he associated himself with the Art Informel movement alongside Michel Tapié and Charles Estienne, with whom he experienced the passionate controversies sparked by their exhibitions, he asserted his desire for expressive freedom at a very early stage and from then on consistently refused to attach himself to any sort of movement - witness his return to subjective figuration towards the 1960s, which placed him outside the trends then in fashion. Gillet went his own way, producing an oeuvre in which caustically traced, ardent forms that are expressionistic only in appearance are brought forth from highly-worked material. The subjects lend themselves to a ferocious style of painting rendered oblique by dreams, irony and humour. Between 1939 and 1944, he studied at the École Boulle, where he acquired a thorough technical grounding and an appreciation of fine workmanship, and trained under Brianchon at the Arts décoratifs. After the dark years, life gradually resumed. Galleries opened, introducing painters such as Wols, Dubuffet, Fautrier, Poliakoff, Tobey and Michaux. Saint-Germain-des-Prés was already becoming the stamping-ground of the new generation of artists. Gillet shared a former tanning workshop in the leather market with friends (it was subsequently occupied by Corneille and Appel). He attended Antonin Artaud's funeral (1948) and went to a lecture on Picasso by the Abbé Morel that degenerated into a riot, himself ending up at the police station. Presently he acquired the middle name "Edgar", courtesy of Michel de Ré, who thought he looked like Edgar Allan Poe. In 1950, while taking part in a group exhibition at the Galerie Mai, he re-encountered his future wife Thérèse, whom he had first met two years earlier at a Wols exhibition at the Galerie Nina Dausset. Nothing is known of Gillet's work from this period, except that he himself said he painted "à la Bonnard" at this time. He taught at the Académie Julian from 1946 to 1948 and worked as a scenery designer and architect. A new generation had arrived, and the decade began with enthusiasm, friendship, emulation, bold undertakings and a huge desire to create. Gillet and his wife occupied a chambre de bonne, which they often shared with old friends and kindred spirits Maurice and Simone Ronet (Simone became Maria Pacôme after the couple separated), all of them regulars on the post-war Saint-Germain scene. Both Gillet and Ronet were actors as well as painters (Ronet soon abandoned painting). They were both in the cast of Jacques Becker's film Rendez-vous de juillet (1949) and featured in Michel Tapié's 1952 book Un art autre où il s'agit de nouveaux dévidages du Réel, followed in December of that year by an exhibition with the same title at the Studio Facchetti, in which Gillet had three works, including Proposition de l'Ignoble (1952) and La Grande Chouette (1952) and Ronet one, Sainte Face (1952). In June, Gillet had taken part in another group exhibition at the Studio Facchetti, entitled Signifiants de l'informel and curated by Tapié, alongside Bryen, Donati, Philippe Martin, Mathieu, Pollock, Riopelle and Serpan - or rather, the second part of the exhibition, the first having taken place in November 1951. In his cramped lodgings, Gillet painted large pictures of all kinds of mystical birds, in a medium composed of sand, rabbit-skin glue and stones, on canvases he bought from Prisunic. There, he was visited by Pierre Loeb, who subsequently showed two of Gillet's pictures in his gallery, and most importantly, by Facchetti and Tapié. It was as a result of this visit that Gillet's work was included in the aforementioned exhibitions. Tapié's flat on the Quai Voltaire contained a hotch-potch of artworks by the painters he had discovered and promoted as "Art Informel", jumbled together with pictures by his great-uncle, Toulouse-Lautrec, his collection of Japanese etchings, Braques and Dalis. Here, Gillet the novice made Bryen's acquaintance. The Gillets frequented the Galerie de France (which merged with the Galerie Caputo in 1951), where they encountered and admired the work of Manessier, Singier, Le Moal, Soulages, Pignon, Tal Coat, Gischia, Prassinos, Lagrange, Lapicque and Estève. They became friends with the Jaguers, small-scale industrialists who used their savings to publish the magazine Phases and mount exhibitions, including two, also entitled Phases, at Studio Facchetti in 1954 and at the Galerie Creuze the following year, when Jaguer himself curated an exhibition entitled Phases de l'art contemporain that included pictures by Gillet. It was there that Gillet met Bachelard and Prince Igor (or Igor) Troubetzkoy. In 1953, Gillet had his first solo exhibition, in a gallery recently opened by a photographer, John Craven, in the Rue des Beaux-Arts. Tapié's exhibition Un art autre was running concurrently at Facchetti's gallery, and the critic dedicated it "to R.E. Gillet, the art of another kind we are bringing into being together". The exhibition went on to Cortina (Italy). That same year, Gillet had a joint exhibition with Mathieu, with whom he had been brought together by for Tapié for Signifiants de l'informel, at the Galerie Evrard in Lille. Gillet's exhibition at Craven's gallery had not gone unnoticed. Guy Marester commented (in Combat, 3 November 1953): "His painting proceeds to fragment lines and shapes, and although it is sometimes zebra-striped with streaks of colour or dotted with sprays of blotches, it is intended to be discovered and to make apparent a structure and an order . . . that it will not erase." Raymond Herbet of the Galerie de France came to see Gillet's work again, along with Gildo Caputo. John Trouillard bought a picture and subsequently gave Gillet's best pictures their entrée in Belgium, exhibiting them with artworks by the group "Cobra". In 1954, Gillet took part in Tapié's exhibition Individualités d'aujourd'hui at his Rive Droite gallery. Lastly, he was visited by a sailorly-looking man who turned out to be the poet and critic Charles Estienne. The foundations of a lasting friendship between Gillet and Estienne were laid. Tapié and Estienne were rivals competing for the same ground with differing stances. They joined epistolary battle every Monday in the columns of Combat. In 1953, Gillet took part in the second Salon d'Octobre, exhibiting at the Galerie Craven. All those involved met up with Estienne in a little restaurant called Poussineau in the Rue des Beaux-Arts. That year, Estienne wrote a piece that features in the book Seize jeunes peintres de l'Ecole de Paris, in the Musée de Poche series published in 1956: "The style of his painting, its quality and I would even say its spiritual odour stem from his sometimes obscure, sometimes sparkling approach to the most mysterious part we modern humans harbour within us, in which a strange entity, obsessed with its own myth, has not yet abandoned the idea of finding rituals and words that conjure up sunlight and ward off darkness. Gillet's painting is the locus of one of these rituals." In 1955, Estienne curated an exhibition entitled Alice in Wonderland at the Galerie Kléber, including works by Corneille, Degottex, Duvillier, Hantaï, Loubchansky, Tsingos and Gillet. There was always a party atmosphere surrounding his exhibitions. "Charles' gang" often met up in Calatchi's shop in the Boulevard Saint-Germain, and Poliakoff, Pichette, Atlan, Bryen, Messagier, Deyrolle, Tsingos, Loubchansky and Gillet were to be found there. In 1954, the Prix Fénéon was jointly awarded to Gillet, Laubiès, Chambrun and Fleury. The panel of judges included Aragon, Berne-Joffroy, Besson, Chastel, Fautrier and Paulhan. The Studio Facchetti held an exhibition to mark the occasion. It was around this time that Gillet met Jean-François Jaeger, the new owner of the Galerie Jeanne Bucher, who purchased a first set of his pictures, and, shortly afterwards, a young dealer called Jean Pollak, who had opened the tiny Galerie Ariel in the Avenue de Messine in September 1952. In 1955, Pollak included paintings by Gillet in his group exhibition Situation II de la peinture, and three of Gillet's pictures were exhibited in the Galerie de France. This led to him receiving the Catherwood Award (bestowed by the Catherwood Foundation), which enabled him to travel to the USA, where he met Pollock and Varèse in New York. In 1956, Gillet had a second solo exhibition at Ariel, to which he remained loyal ever afterwards, showing his recent work there. In 1959 he exhibited gouaches. His compositions were evolving towards increasingly rigorous struc­tures, highly-worked, austere materials and a predominantly ochre and brown palette. Georges Boudaille saw mating insects in them; Jean Grenier, coats of arms and ceremonial emblems. Grenier wrote: "Gillet's world is opaque but not oppressive. Its actual structure is akin to the vignettes, tailpieces, frontispieces and colophons that adorn books . . . mainly Roman fasces and flagpoles . . . Another sort of motif in Gillet's work appears to have been inspired by insects . . . beetles or crabs with their armour and pincers. Both categories are aggressive, but this is attenuated by the serenity of the muted tones." (Preface, Gillet exhibition, Galerie de France, 1959). In this period, Gillet exhibited at the Galerie de France three times, in 1959, 1961 and 1963. He had overseas solo exhibitions at the Galerie La Licorne, Brussels, in 1954; at the Palais des Beaux-Arts, Brussels, in 1957; at the Galleria Blu, Milan, in 1960; at the Galleria La Bussola, Turin, and the Galerie Lefebvre, New York, in 1961; at the Galerie Moos in Geneva and Galerie Birch in Copenhagen in 1962. In 1964, the Galerie Dina Vierny, in Paris, showed a set of his drawings and the Galerie Françoise Ledoux exhibited prints by him. Drawing and printmaking were techniques Gillet used regularly, alongside oil painting. He saw drawing as an exploratory medium and an aid to memory. In 1965, he had another exhibition at the Galerie Ariel, Terre d'ombre, ou de la peinture de Gillet, prefaced by Estienne, who spoke of Gillet's return to the figurative from 1963 onwards, which was exemplified by the pictures in the exhibition, as if it were a form of divination: "It is 'painted traditional', by which I mean that the technique and the way the medium is used . . . are those that have been in use since the Flemish painters . . . So what? What indeed? It is only after the choice of materials that the adventure begins . . . that we penetrate to the innermost depths of pleasure that induces material - the 'Mother' in the Faustian sense - to give birth to the images with which it is pregnant . . . divination seems to me . . . to contain a higher concentration of dreams, which directly attacks material to make it yield up its secrets . . . It is there that the act of visual creation is accompanied by and could easily be mistaken for something close to alchemy, since what is happening is the elevation of formlessness into form - no less . . . But Gillet's abstraction is not non-figurative and his figuration is not realistic . . . 'From shadow and night emerge pale, gravely motionless figures that dwell in the chamber of limbo.'" He calls his first figures, still mere larvae that have only just emerged from a world of the beginnings of time, 'Saint Thomas' or 'Veiled Figure', because their features disappear under the strokes of the brush. This gradual resurgence of figuration in a body of work that had until then placed freedom above the image, renewed the connection via the lyricism of material in which it was initially forged. Gillet was first and foremost a painter, and in the early 1960s, he was not seeking to achieve resemblance. He conjured up a world of inchoate figures stumbling out of the shadow - embryos belonging to a distant past. The scene is set for a strange form of theatre. Enter a procession of livid silhouettes in muted tones, suddenly illuminated by shafts of light from outside. Over the years, his puppets gradually take on individual characteristics, first hinting at, then openly flaunting their passions, their folly and their absurdity. This work draws us into an overt denunciation of the constant hypocrisy in which we live our lives. It resulted in a number of series: Les nains, 1973-1974 (exhibition at Galerie Ariel, 1973; catalogue); Les villes, 1975-1976; Les bigotes et les juges, 1976-1977 (exhibition at Galerie Ariel, 1976); Les musiciens, 1978-1979 (exhibition Gillet et nos portraits, Galerie Ariel, catalogue by G. Marester); Les gens d'Eglise, 1979; Prisons et Palais (exhibition at Galerie Ariel, 1982) and Les mutants, 1986 (exhibition at Galerie Ariel; catalogue). More recently, Gillet showed his latest work at the Galerie Ariel in 1988 (catalogue by Lucien Curzi), and at FIAC, the Galerie Ariel (La marche des oubliés; catalogue) and Saint-Priest (where he showed Le peuple en marche for the Bicentennial of the French Revolution) in 1989. 1954 Aspect de la peinture contemporaine française, Galerie La Licorne, Brussels, curated by John Trouillard. 1955 Individualità d'oggi, Galleria Spazzio, Rome, curated by Michel Tapié. 1956 10 ans d'Art français, Musée de Grenoble. 1957 Le Petit Format, Galerie La Roue; Lauréats du Prix Fénéon, Maison de la Pensée française. 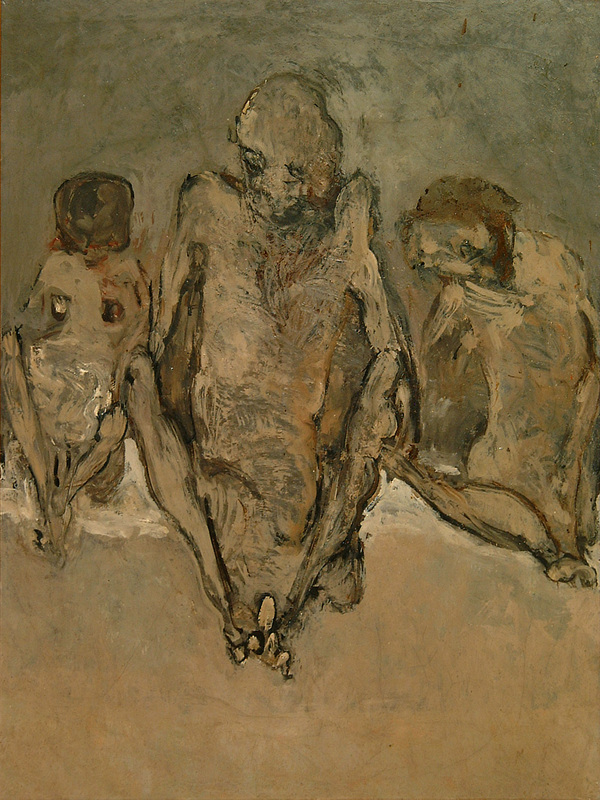 1958 Gillet, Levée, Maryan, watercolours, Galerie de France; Situation III, Galerie Ariel. 1959 Travelling exhibition of French contemporary painting in Austria and Poland. 1961 École de Paris, Galerie Metropole, Malmö. 1961 and 1962 Diptyques et triptyques d'artistes contemporains, Galerie Creuzevault, Paris. 1963 École de Paris, Tate Gallery, London; Vingt-cinq peintres de Paris, Hallands Konstmuseum, Halmstad and Umea, Sweden. 1964 Quinze peintres de ma génération, curated by J. Pollak, Galerie Ariel then Galerie Birch, Copenhagen; Gillet, Bitran, K.B. Gallery, Oslo; Quinze peintres de ma génération; Galerie L'Atelier, Toulouse; Vingt-huit peintres d'aujourd'hui, Galerie A. Schoeller, Paris. 1965 Gillet, Jorn, Leroy, Galerie Nord Lille. In addition to numerous group exhibitions in Europe, in 1967, Gillet took part in Vingt-quatre peintres de Paris, curated by J. Pollak, at the Seibu Gallery, Tokyo, Japan. Gillet twice showed work with the group "Divergences" at the Galerie Arnaud: in 1956, for an exhibition entitled Libertés et disciplines - a theme chosen by Herta Wescher; and in 1957, for an exhibition entitled Affinités, curated by Michel Ragon - a selection also shown at the Festival de l'Art d'avant-garde, Cité Radieuse, Rezé-lès-Nantes, in which Gillet showed L'épouvantail. In 1957, Gillet was invited to take part in the exhibition L'Ecole de Paris at the Galerie Charpentier. Cube éclaté, 1961 Figure, 1962 and 1963. Gillet regularly took part in the Salon de Mai from 1955 onwards, and was a member of the Committee until his resignation in 1970. He took part in the Salon des Réalités Nouvelles from 1959 to 1964, and in the Paris Biennale in 1957. His penchant for material, from which, like a demiurge, he brings forth convulsive, painful shapes whose faces become universal because they are individualised as well as belonging to character types, was bound to take him in the direction of sculpture, in which he displays equal talents. The jaundiced world view his work conveys should not obscure his compulsive need to paint and the huge pleasure he takes in doing so, regardless of whatever may be happening on the art scene. 1971 Gillet, Vingt ans de peinture. Musée Galliéra, Paris. 1978 Gillet, 30 peintures de 1958 à 1962. Galerie Jeanne Bucher, Paris. 1981 Rétrospective R.E. Gillet, Saint-Priest. 1987 Gillet, rétrospective. Centre national des arts plastiques Paris. Catalogue by Anne Tronche. Museums: Paris (Musée national d'Art moderne, Musée d'Art moderne de la Ville de Paris) - Lille - Grenoble - Oslo - Brussels - São Paulo. R.E. Gillet, Monographie. J.F. Guyot, Paris 1980.